Sometimes, I really, really wish I could take the Way Back Machine and latch onto Pansy’s group as they enjoyed the apparently mesmerizing lectures by a flamboyant Middle Eastern-born tour guide named Augustus Oscar Van Lennep. Not content to introduce the lakeside miniature Holy Lands that are a relic of Chautauqua’s Sunday School Assembly days, this enterprising, creative fellow dolled up in “Oriental” costume to give his lectures. That’s our man below, lounging in Rajah-like style, while his indulgent friends retain their upright Victorian postures. 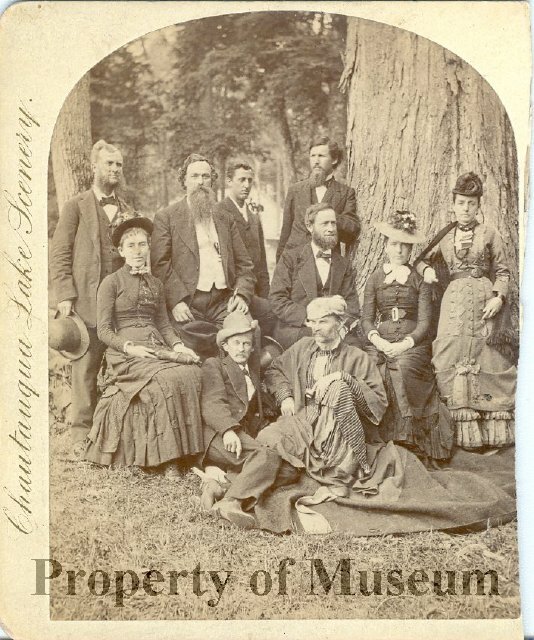 Courtesy of the Chautauqua Institution Archives. 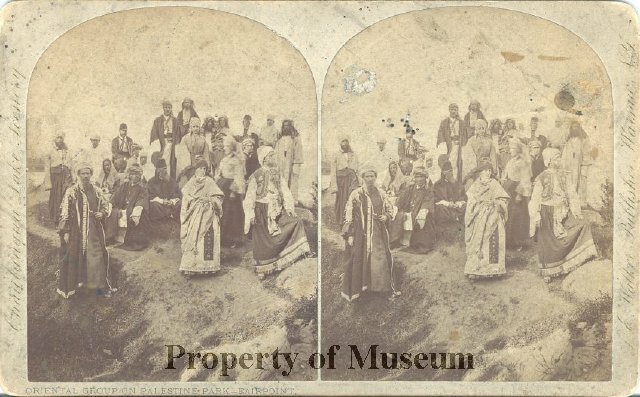 Gus must have had an equally fun set of folks who joined him—witness his jolly crew of costumed believers at Palestine Park in 1875/6-ish. Can you imagine??? Oh, how much fun must that have been! 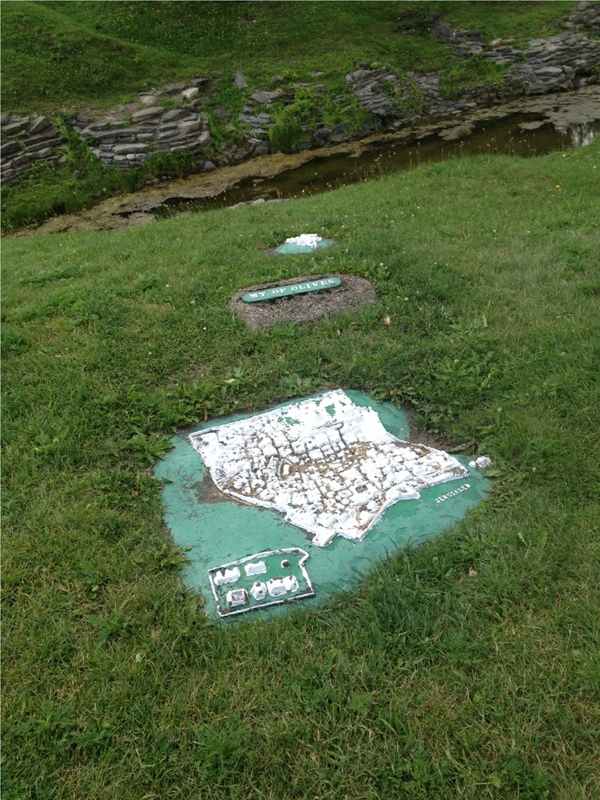 Alas, today the Park is largely neglected and used more as a family playground than an instructional living map. 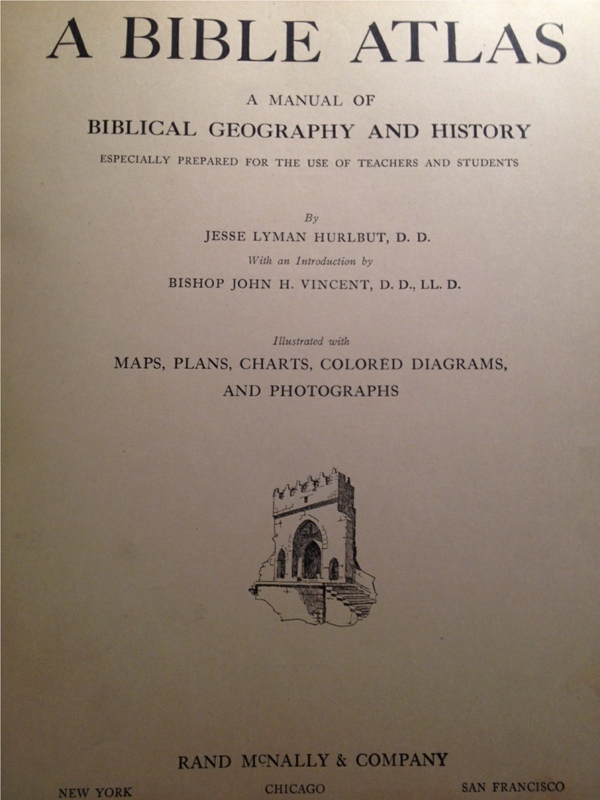 I’ve been studying a 1920’s Bible Atlas by Jesse Lyman Hurlbut (Chautauqua lecturer, founding father, and big-time booster) to gain a working knowledge of the Holy Lands. 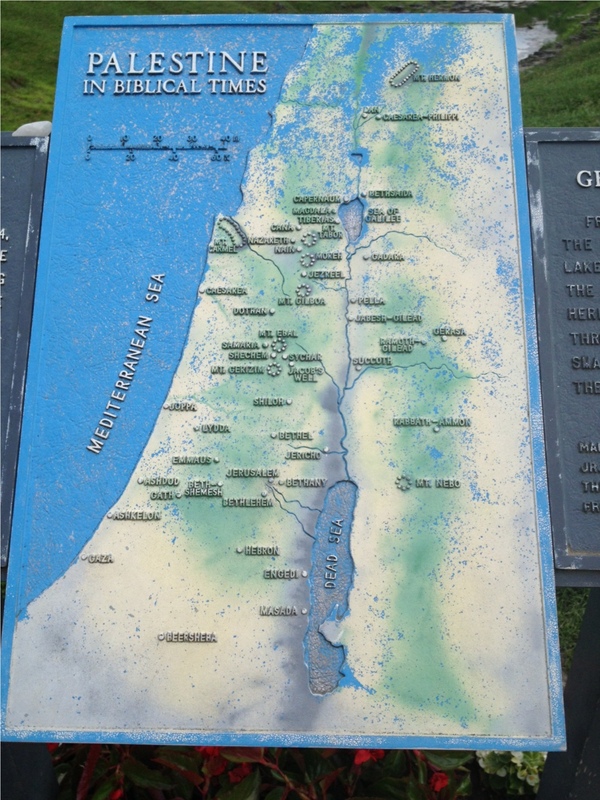 As Dr. Vincent believed, I think understanding the topography and layout, relative distances and terrain of Palestine environs is extremely helpful when reading Scripture. I mean, when you see how far Gideon and his 300 brave soldiers had to track the Philistines, you really do understand why he was so angered when the locals wouldn’t give them any foods to keep their strength up! 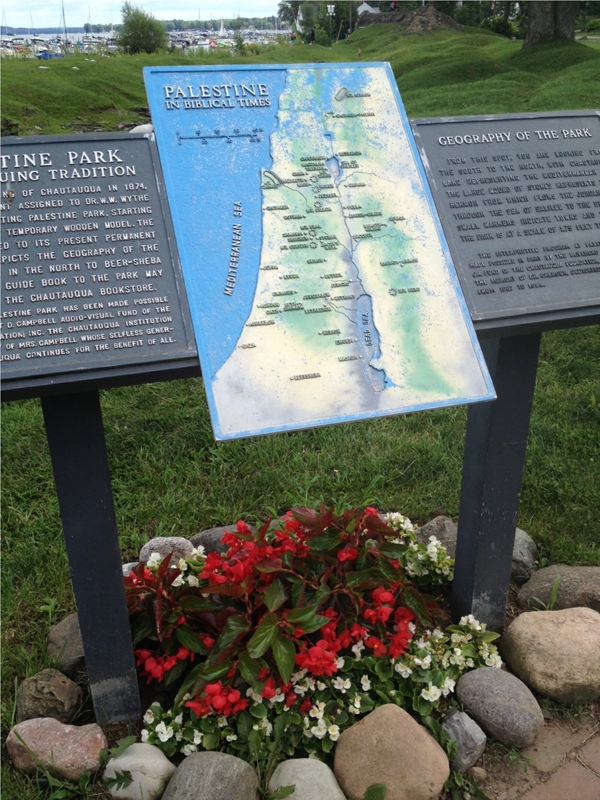 According the Pansy’s many charming references to the Palestine Park, students were treated to not only the basic layout, but tiny townscapes and identifying plaques dotted the carefully crafted map. Bible verses connecting each significant stop provided context—and reasserted the importance of the location for the Christ-following traveler. 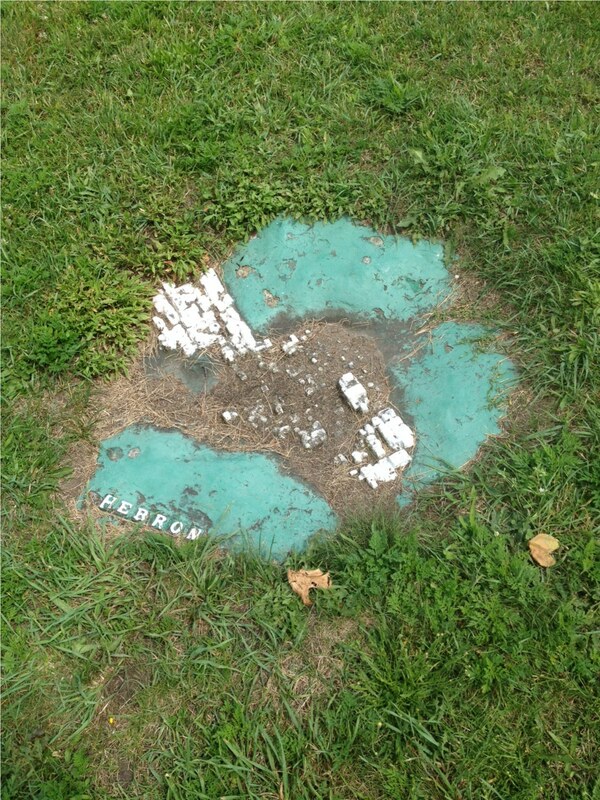 Today, in an effort to keep the residual charm of the place, small cast iron plaques are embedded along the landscape—they’re kept painted and somewhat landscaped. I understand there’s a “tour” each Sunday night and I hope to attend it someday. I paced off various Bible place names made familiar by my Old Testament studies and was genuinely surprised to see how concentrated a radius these events encompassed. Here’s Jerusalem in relation to the Mount of Olives, only a stone’s throw from Bethany. Mount Hermon in the distance provides the perfect “king of the hill” locale for the resort’s kiddie population. The impressive crevasse made me wonder if erosion hadn’t made the Jordan Valley a bit too deep? 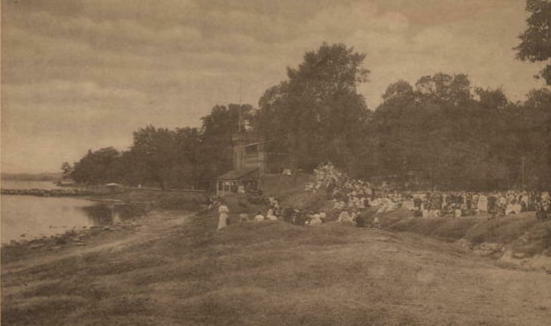 Compared to the vintage postcards you’ll find in this blog’s archived Chautauqua posts (see the links at the conclusion of this post), I’d say the accuracy factor might be off a bit these days. 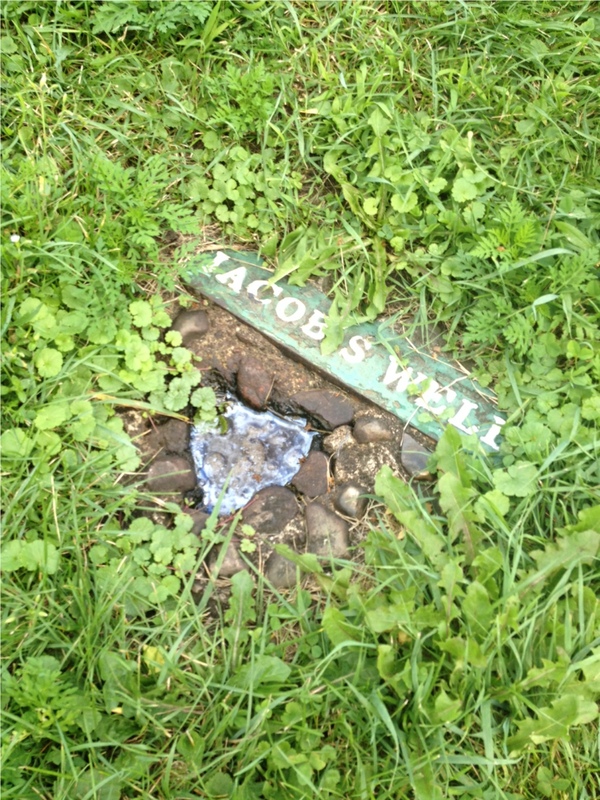 Is someone is tending Jacob’s Well? 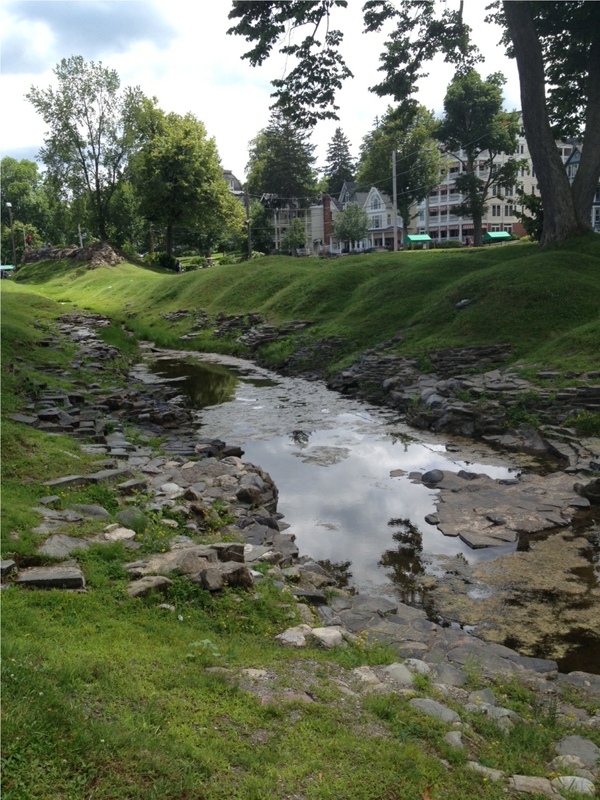 Even on the dry day I visited, it was filled with water. My favorite? 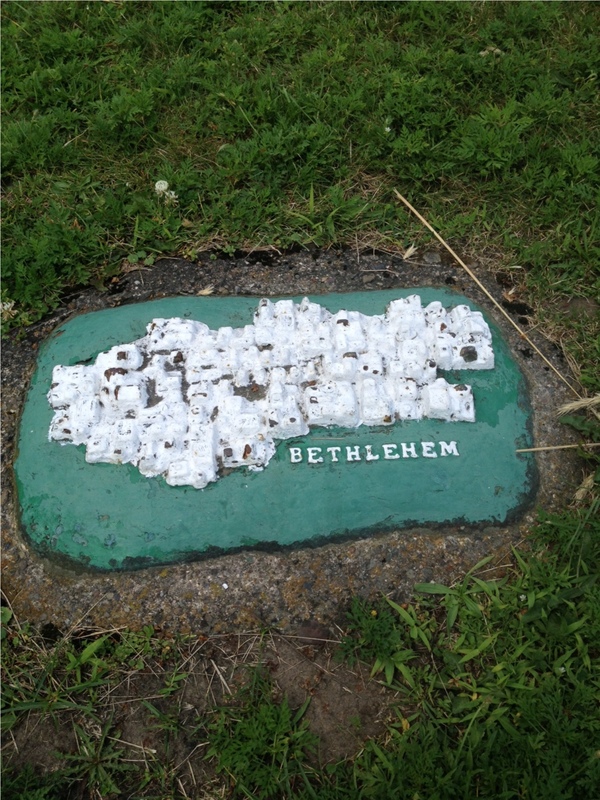 The truly little town of Bethlehem. 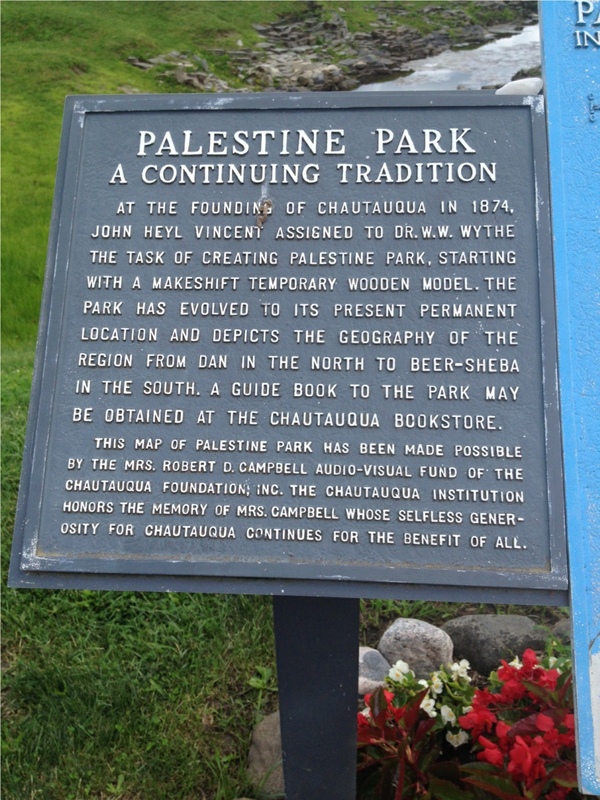 I read the plaque as I exited the park, wistful at the thought of those tent-dwelling Sunday School teachers, nestling eagerly beside the “Mediterranean Sea” and along the shores of the Jordan, to understand more about the lands their spiritual ancestors walked. What would they make of this rarely visited, gently poignant reminder of the Park’s original purpose? Today, no Bible markers or tablets grace the small stony stand-ins, no tiny replica buildings remain to represent scenes from the life of Jesus as they did in Pansy’s time. 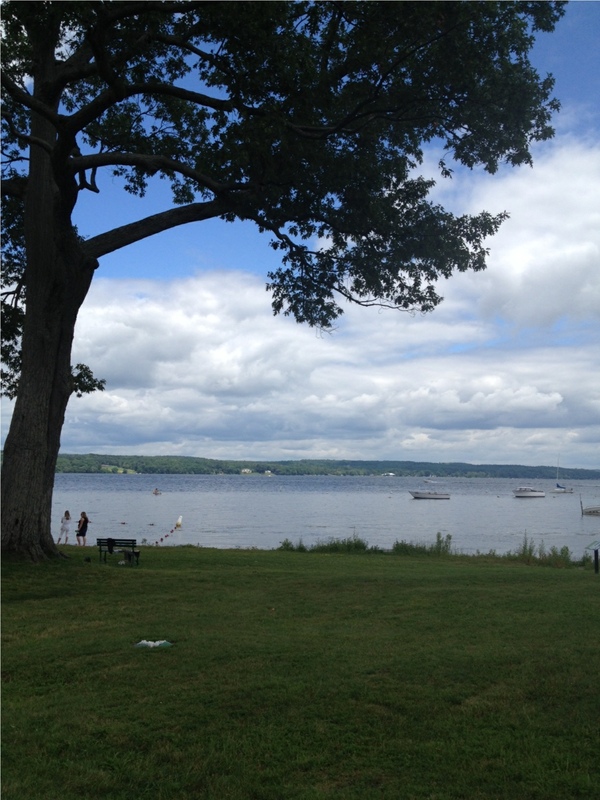 I turned my gaze to Chautauqua Lake, imagining the steamer pulling up to the nearby dock and unloading four lively 19th century girls, eager for fun, not knowing they would never be the same, thanks to their time in this beautiful place. 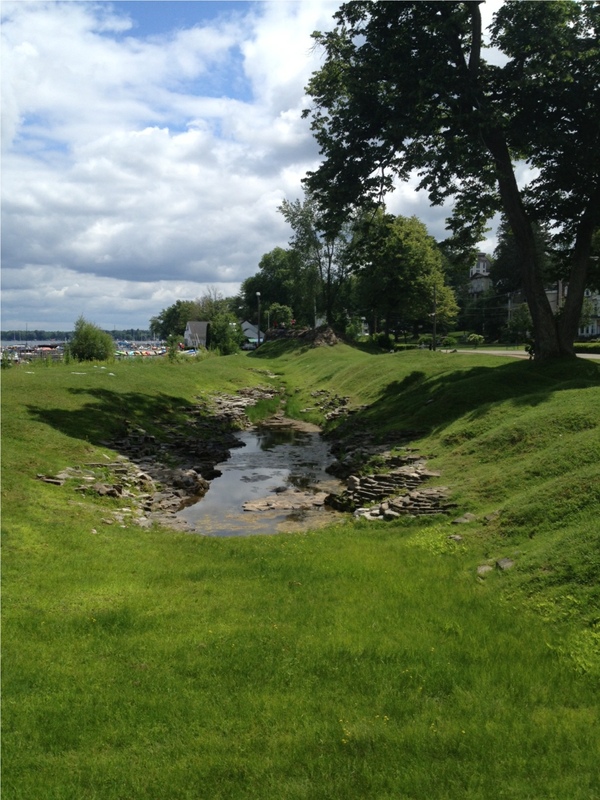 Thanks for allowing me to share these mementos with you of my all-too-brief Chautauqua visit. My hope and prayer is to return soon to follow further in Isabella’s footsteps. My fascination has led me to launch a tribute Chautauqua Literary & Science Circle reading plan—I’m pairing 19th century texts with contemporary works and next August, I hope to carry the Pansy Year banner in the Recognition Day parade. Interested readers can follow along with my literary journey at my blog, The Hall in the Grove.